This is going to be my champion in the command squad. I stole this idea from Kriswall on Dakka Dakka. The pose of the seargeant really works well with the halberd. I'm still debating whether I should leave the halberd as is, or if I should convert it like this, or if I should just leave it. Here is an Idea for one of the sergeants. I used a bit from the Grey Knight terminators that is holding the bloodletter head. 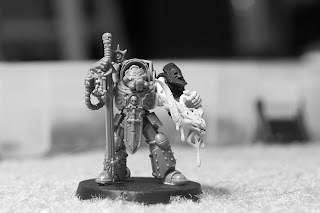 I am making my army look like they are in constant battle against chaos, so I really liked the idea of this seargeant being a master swordsman who just killed a daemon champion. If you look closedly, you can see that his right eye lens has been damaged with a slash going down it (it will be more obvious after it's painted). I'm going to be putting little bits of battle damage like this here and there, but the army will be mostly pretty clean. This is one of the first major conversions that I have done. I made some robes out of greenstuff, but I removed the robe between his legs because, being one of my first greenstuff projects, it was pretty rough. I also used greenstuff to increase the length of his torso just enough to make him a bit taller than other terminators, and so his head didn't looks so big. I used the method that Ron at Fron the Warp shows in his truescale terminator tutorial. So this guy is mostly done, but I will be redoing the robe. 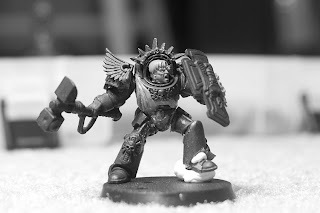 The iron halo is from the metal terminator chaplain. I baked it in the oven at 150F (I think) for about an hour to soften it up, and used the handle of my hobby knife to bend it out so it would fit. I think that I will actually cut the plastic below it so I can move it down a bit. Well that is it for today. I have a bunch more going on with the Deathwing still, so be looking out for more updates! All very nice stuff. I love Belial! Good work thus far on the terminators; they are shaping up nicely. I really like the champion thus far. 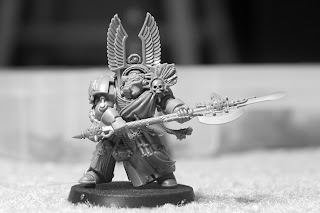 Swapping the halberd with the Sanguinary Guard axe is a great idea. I think I would go through with the conversion, however I would not add that upper sword blade to the axe like the Deathwing one has (looks over the top in my opinion). Also if you do end up using the Sanguinary Guard axe, remember to fill in those little blood drops on the blade. I like how the first of your sergeants is turning out too; the battle damaged helmet is a nice touch. I think he might look nice if you gave him that cape in the Deathwing command box (it would fill out the model nicely). Also remember to add one of those little daggers to his waist. Thanks! 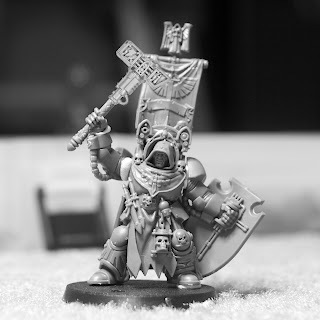 I agree that the sarge needs something to fill out the model because right now it is a bit wimpy looking, but I really want to use that cape on Belial (you can't see it on him because of the angle, but Belial is wearing it right now). maybe I'll try my hand at making one out of greenstuff for the sarge. That would be a nice challenge! The champion looks really nice. I was not too fond of the model straight from Dark Vengeance, the sword arm always look a bit off to me. But it works remarkably well with the halberd. I think Belial has a lot of promise, but would suggest that you shave away a little of the back of the hood such that it recesses into the armour deeper. As it is now, I feel his head would not fit on the body, unless is neck is long and flexible, he he. Also, personally I do not really like how some of the robed torsos have two targeting devices above their helmets. I think it looks excessive, and with the arched design on the DW ones, I think it looks overly crowed and a gaudy. It is a minor thing though. I am planning on moving Belial's head back a bit like you said. The way the heads are out of the box, they are looking down, but I wanted him to be looking either straight out, or maybe up a little. I've also been toying with the idea of removing the faces completely as if their face was back farther in the shadows. That would give them a bit more of a mysterious look. This guy did it, and I think it turned out really good! As for the Blood Angel Icon, the army I am making is actually Blood Angel/Dark Angel allies. I will be using the Dark Angels rules for the deathwing, but at least one squad will be blood angels. Basically, the two forces were fighting together, but were caught in a warp storm for a very long time, and during that time fighting against chaos together, they have become one force. So you will see a mix of Blood Angel and Dark Angel iconography in my army, but it will all be painted the same. Ha! I just realized that I sent you a link to your own blog! So i guess I should change that to say that I really liked what YOU did with your hooded heads, and I might be stealing that idea from you. I like the Dark Angel and Blood Angel ally idea. It brings back memories of the Angels of Death 2nd edition codex (I too have a bunch of Blood Angels, having painted my 2nd edition starter marines as both BA and DA, he he). I would encourage removing the face. It is pretty easy, and it largely removes the issue of the head being unnaturally attached. Regardless, keep up the good work! I look forward to seeing the terminators progress! The alliance started just because I really liked those two armies ever since I started in the hobby. I started with Blood Angels, but with the new allies rules I decided to finally add the Dark Angels as well. I think the two really go well together, and like you said, they were even in the same codex back in the day!